With a five-year warranty, the Mountfield S421R PD guarantees you high performance for years to come. The longer than average warranty prove Mountfield are serious about the quality of this self-propelled lawnmower. The cutting width of 41 centimetres (16 inches) shortens the time it takes users to cut small and medium size lawns. For those who want to create immaculate stripes, this is the lawnmower to do the job right. After you finish cutting a lawn of up to 20 meters by 20 meters, the uniform stripes produce a beautiful lawn that you can sit back and admire. 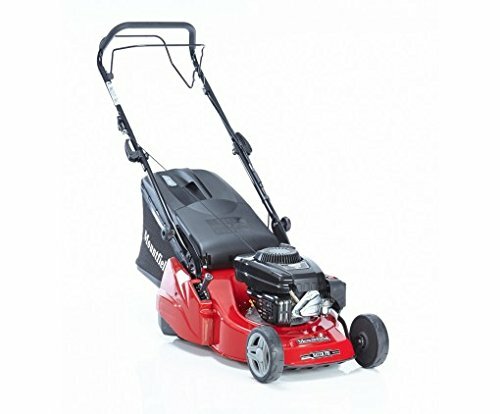 This lawnmower features a powerful 100cc Mountfield RS 100 OHV, four-stroke engine. Steel comprises the bulk the chassis, allowing you to cut grass in all conditions without any question of durability. 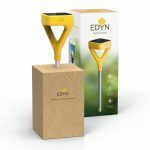 Five grass-cutting heights extend from 20 millimetres to 70 millimetres, and you select grass heights by simply pulling an easy to move lever. You never have to exert much force to get the grass height of your choice. The self-propelled drive removes the strain of pushing the lawnmower, especially up hills. At 55 litres, the grass collector saves you time by reducing the number of trips to the compost pile. If you’re after more control over grass cutting speed, you might be disappointed with this lawnmower. You’ll find you move at a fixed speed due to the lack of a throttle. Some reviewers also comment that the accompanying manual doesn’t have a section in English. Although the rear roller improves the lawnmower’s movement, it still feels somewhat heavy to pull out and push in and out of a garage or shed. For small and medium lawns, you can’t go wrong with the power and cutting width of the Mountfield 41cm Self Propelled Petrol Rear Roller Lawnmower. The five-year warranty proves Mountfield has the utmost confidence in this self-propelled machine. Steel comprises the chassis to ensure long lasting durability. The real only downside with the lawnmower is the fixed speed caused by the lack of a throttle, so if that doesn’t bother you, you won’t have any issues.